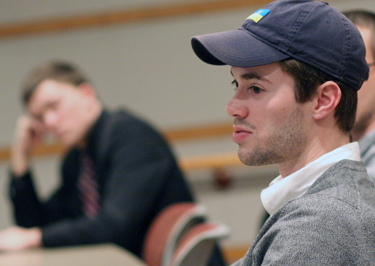 Scott Morrison ’14 – The frigid temperatures did not stop roughly 50 enthusiastic Wabash students from attending a flash discussion on President Barack Obama’s State of the Union Tuesday night. The event co-sponsored by the College Republicans and Democrats as well as the Political Science and Rhetoric Departments, provided students with a unique opportunity to view the address while having a little fun. Nathan Manning ’14 joins the post-speech discussion. The flash discussion featured two screens for those in attendance. One featured the President’s address, and the other featured a constantly refreshing Twitter feed started by the sponsors with the hashtag #WabashFD. 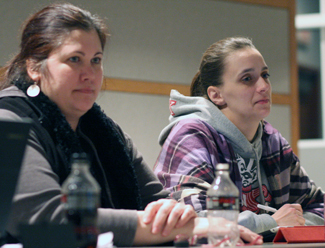 Professor of Art Stephanie Rossi and Chemistry Professor Laura Wysocki joined the evening’s discussion. 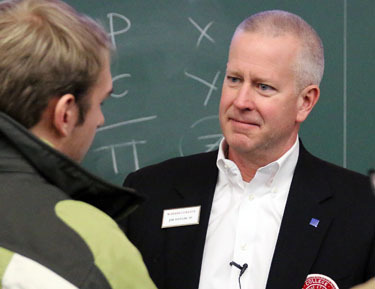 Howard W. Hewitt – Jim Davlin ’85 told a large group of Wabash students Friday that pricing any consumer product has many variables, some obvious and some less so. Davlin ’85 talking with students after his lecture. 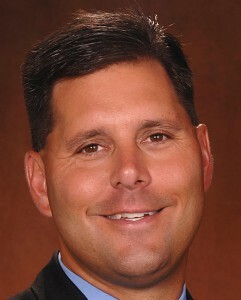 Davlin, a Wabash Economics major, is now General Motors Vice President Finance/Treasure. 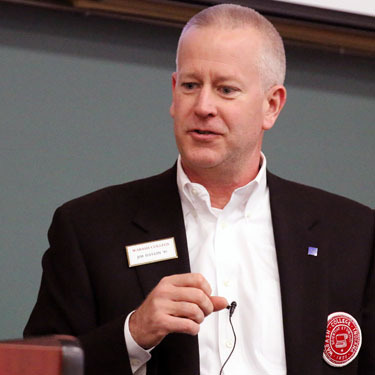 The Wabash Trustee used the stops of his career to illustrate the differences. Before joining GM, Davlin had worked at consumer goods giant Procter & Gamble, Eli Lilly Pharmaceuticals, and John Deere. Even though he is at a corporate level now, he has had “a lot of line development for products.” He used the example of dish soap or laundry detergent to start his talk. The components of cost, competition, are relatively simple, he suggested, but packaging can also have a huge impact with consumer goods. The market is fickle. Drugs can greatly aid one healthcare affliction while causing other patients side effects. The customer, Davlin said, must weigh price against result in unique ways no at all like buying dish soap. Davlin ’85 talking about GM finance. Davlin’s time at John Deere gave him a new-found respect for agriculture. “Farmers are dramatically underestimated for their financial savvy,” he said. He explained farmers will weigh the benefit and gain of buying new equipment, its impact on harvest, prices, and labor in determining what they will pay for a new tractor. He jokingly noted that most of the young men probably wanted to hear more about selling Cadillacs than tractors so he used Cadillac’s 2013 introduction of its new ATS as an example. He explained how the company tried to position the vehicle in comparison to a similar BMW. But the other factor for pricing in the auto industry isn’t just market demand, raw materials cost, and the other components. Auto manufacturers also must consider how a vehicle price-wise fits in its own lineup. 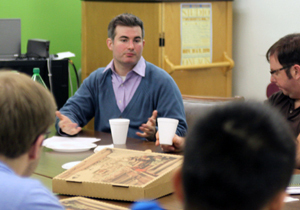 Students peppered the GM executive with questions for the remainder of the hour. He talked about targeted advertising, GM’s downsizing, and the company’s substantial financial turnaround since 2008. Brent Harris – Wabash College students peeked behind the theater curtain Tuesday afternoon thanks to a visit from Donald Claxon ’06. 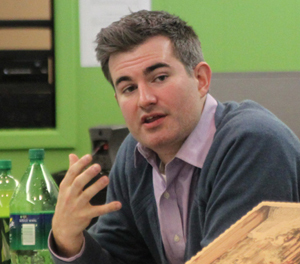 Claxon returned to his alma mater to discuss the duties and responsibilities off stage in both theater and opera productions. He also brought a wealth of experience and personal stories from his work in Chicago. After graduating from Wabash, Claxon attended the Yale University School of Drama, earning his masters in stage management in 2009. He has worked at various theaters in Chicago since 2009, most recently serving as the stage manager for the Grant Park Music Festival, assistant stage manager and production manager at the Chicago Opera Theater, and assistant stage manager at the Court Theater. After listing the various technical theater positions, Claxon focused on more specific day-to-day responsibilities. “When I was at Yale, some production managers were only known by the color and number of post-it notes on their desks,” Claxon said. “I enjoy being back stage and getting to know the actors. My job is to assist them in any way possible so they can focus on their role. Claxon, who worked as a production assistant with Nathan Lane and Bebe Neuwirth in “The Addams Family: A New Musical” in 2009, talked about the different challenges created by different types of shows. Richard Paige — He drew me in with a well-emphasized have. Listening to Brent Bolick ’91 talk about his life in and around Florida, those words confidently paint a picture of a guy who likes where he is. Currently, he’s the Jacksonville Division president of Clear Channel Outdoor advertising. Along the way he’s held titles like salesman, fundraiser, landscaper, and public affairs manager. Brent Bolick ’91 is the president of Clear Channel Outdoor advertising in Jacksonville, Fla.
Undaunted, he went to work right out of college on Steve Goldsmith’s mayoral campaign in Indianapolis. That led to a fundraising gig with U.S. Sen. Dan Coats and his 1992 re-election efforts. Bolick passed on an opportunity to work full-time with the Coats local administrative staff and ended up working at a Carmel landscape company with more than a handful of recent grads. He did a stint with Sue Anne Gilroy’s secretary of state campaign in 1994 before settling into a public affairs position with IndyGo, the regional transit authority. From there, he took a chance with Clear Channel Outdoor, worked his way up, moved to Florida to pursue administrative opportunities, eventually rising to president and overseeing 26 people in his Northwest Florida region. Bolick feels his Wabash education gave him the flexibility to handle whatever challenge awaits. While his primary focus as president is to work with community leaders to provide for sustainable growth and consistency of regulation within the industry, one of the benefits of his multi-faceted approach was to learn all aspects of his business. While the digital age has affected many, including game-changing developments in the billboard business itself, one thing still ties him to his college days. He’s an old-school note taker. What is your favorite Wabash tradition? Monon Bell. We were 0-4 when I was there, so I kept going back until we won one, which we finally did. That’s where I’m able to connect with other alums. The tough part of living down here is just how easy it was to stay connected by going to that one game. Success and failure are a part of life. To this point, what has been your favorite mistake? Not taking that job with Sen. Coats in Indianapolis. It was lesson about humility and a hard way to learn it. If you could cook one meal, what would it be? If you could give your 10-year-old self a piece of advice, what would it be? Oh, there is so much. Self-esteem and being comfortable in your own skin would be where I’d start. If you have a personal credo, what is it? If in your dreams you could have created one great piece of art – painting, song, sculpture, prose, etc. – by any other person, what would it be? I have no idea. I’m not an artsy guy. I was always fond of Beethoven’s Fifth Symphony. If a picture is worth a thousand words, what are you doing in that picture? With any luck, I’m retired and it’s a big family portrait. If you could wish for one thing in your future, what would it be? Do the best I can to get my kids through high school and college and off on their own. Hopefully, you did it the right way. I wish there was a guidebook, but there isn’t. Jason Siegel ’08 with wife, Breanna, and son, Jack. Richard Paige – This most recent winter storm makes me wish I were in Jason Siegel’s shoes. Ten days ago he and I were steps away from the Atlantic Ocean sharing the joys of a sunny, 80-degree day in Jacksonville, Fla. The snowfall blanketing campus today is not a reasonable facsimile for a white-sand beach. 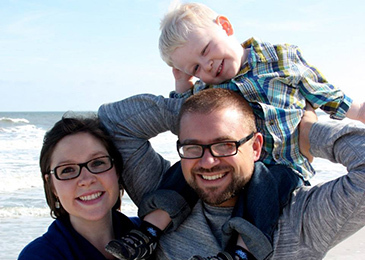 Jason is a resident at Jacksonville’s Mayo Clinic. Four years as a biology major with a chemistry and math minor propelled him to medical school at IU before earning a residency at one of the Southeast’s most reputable medical institutions. Siegel’s dreams of being a doctor date back to childhood. The neurology came a bit later. I asked Jason, now midway through his residency, what surprised him most about the medical profession, and he didn’t mention long hours of study, patient care or the rigors of residency. He mentioned the grunt work – transcribing notes, putting in orders, calling nurses. The stuff you never see on television. My friends who went to bigger state schools had a little advantage over me in med school at first because you sit in a big lecture hall and you get PowerPoint lectures and you have to memorize them. It’s straight memorization of notes and textbooks. There is not a ton of critical thinking. At Wabash it’s the exact opposite, even in the sciences. There is a lot of discussion and interaction. Don’t get me wrong, Biology 111 and 112 at Wabash was a lot of memorization, but there is a lot of compare and contrast. You have to think critically. There wasn’t a lot of that in the first two years of medical school. But in years three and four, and definitely in residency moving forward, you don’t do that. It’s taking a patient, figuring out what’s happened, solving the puzzle and communicating that plan with the patient. You can be very good at memorizing textbooks, but you have to be good at making connections. That is where Wabash helped me the most. Thinking critically is something I do every day. In trying to take care of people – living humanely – I’ve found there is a bit of resistance to people listening to doctors in general. Part of that resistance is because when you go to a doctor, you are bearing a lot, you are very vulnerable. Sometimes we don’t appreciate that and deal with it very well. Having empathy for what the patient is going through, whether it’s someone helping their mom with a stroke or someone who’s just been diagnosed with Lou Gehrig’s Disease, the undergraduate education I’ve seen at other places doesn’t prepare students as well as what I had at Wabash. My favorite week every year is Monon Bell week. The campus just has a different energy. The freshmen staying up ringing the Bell, guarding the Bell. That’s my favorite tradition, the Monon Bell festivities. I’m thinking of two things. One is a very tender New York Strip steak – juicy and pink in the middle – just perfect. The other thing is a perfect batch of chocolate chip cookies. I love cookies. If I could make my grandma’s cookies – they were always soft and gooey, chocolate melted just right when they come out of the oven. If I could do that, I’d be pretty happy. I would tell him to start figuring out who he is as soon as he can. Figure out what you are good at, and what you are not, as early as you can and let that guide you through big decisions in life. There is a Greek temple for Apollo. There are three things inscribed on it: know thyself, all things in moderation, and in essence, know that you can’t control everything. Those are three things that have guided me since high school and I’m most cognizant of when making decisions. Oh man…My favorite piece of art is a song called “Jupiter” by Gustav Holst, a classical composer who played piano and trombone. He wrote a suite called “The Planets.” If I could have written “Jupiter” – it’s my favorite song ever – that would be something to put my name on. I’m probably with my wife and son and we’re all laughing. Do people usually put that much thought into this? (laughs) I have to make sure this is right. I want to make sure my kids are on the right path…figure out who they are, make good decisions and are happy and successful in life.